In addition to Satellite Train KF-119, Kusan also made set KF-139 as pictured below. A video of this train may be seen here. It is challenging to find a complete set in operating condition. Kusan catalog number KF-139 Satellite Train set. Kusan catalog number K-39. U.S. 135 Alco 21938 locomotive. The lever on top of the engine may be set to Stop, Slow, or Fast. The Slow speed position is best for keeping the foam satellite suspended above the train while in motion. Note the large red nose light on the engine front. Kusan catalog number K-902. 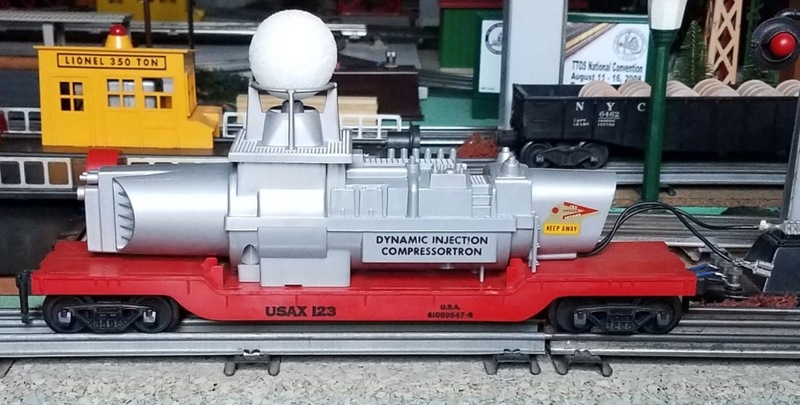 USAX 123 Dynamic Injection Compressortron. The two electrical leads plug into the rear of the Alco locomotive. A motorized blower inside the gray superstructure keeps the polystyrene foam satellite suspended in the air as the train travels around the layout. Kusan catalog number K-310. U.S. Space Rocket Fuels 1776 gondola. It carries a load of 18 wooden green, red and yellow nuclear gas bottles. Kusan catalog number K-461. USAX 123 drop center flatcar with two light blue watertight cases. Kusan catalog number K-704. Radioactive Waste X-723 tank car. Kusan catalog number K-521. 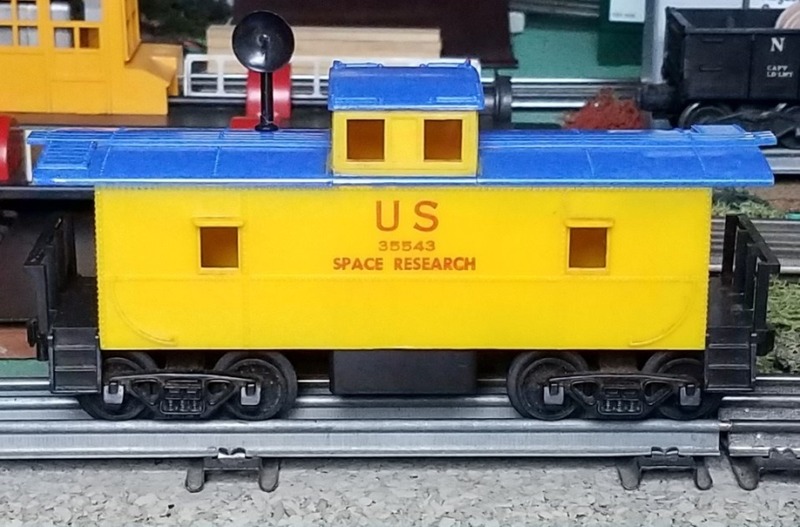 U.S. Space Research 35543 caboose. The black directional antenna on the caboose roof is often broken off.